Mouseketeer comes clean on the 1970's Mickey Mouse caper. It was a Mickey Mouse prank that was one for the ages. In the early morning hours of April 20, 1978, a small group of students calling themselves the Mouseketeers placed a giant cardboard picture of Mickey Mouse over the face of the clock on Wait Chapel. 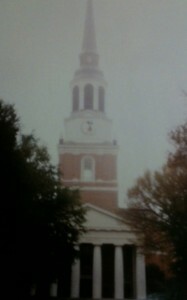 You have to look closely, but that’s Mickey Mouse on the Chapel clock. Why’d they do it? “Y? Because we like you!” one of the Mouseketeers told the Old Gold & Black. “See you real soon!” They just wanted to bring “some harmless humor to this dull campus,” another student told the OG&B. None of the pranksters was ever publicly identified or punished. 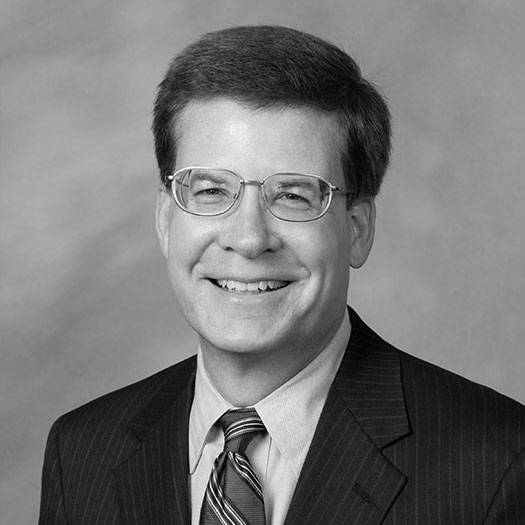 But in 2012 — with assurances that his Wake Forest degree is safe — one of the merry mice came clean. 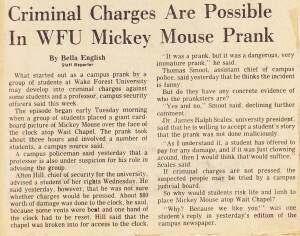 He’s not wearing a white short-sleeved turtleneck with MIKE printed on it, but Mike Toth (’79) was one of the proud Wake Forest Mouseketeers. He was the one brave enough, or crazy enough, to pull off the most daring part of the caper. He was the outside man on the “steeple assault team,” dangling from a rope 100 feet above the ground to affix the 10-foot high Mickey on the clock face. “My biggest fear was not plunging from the roof to my death,” he said, “but not getting back inside and having to call the fire department” to rescue him. Hanging off the side of Wait Chapel at 2:30 in the morning was a sure ticket back home. 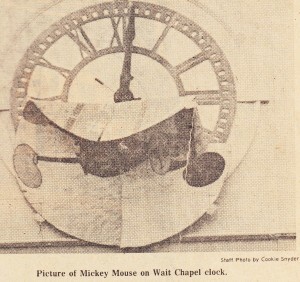 A photo from the Winston-Salem Journal shows MIckey Mouse being removed from the Chapel clock. Toth, a native of Florida, had actually worked at Disney World. But the idea started when a professor innocently related some college pranks to his students. The professor was briefly under suspicion for “advising” the students, but he played no role in the mouse caper. Off went the students to plan their own prank. Wait Chapel was the obvious target, and students took it as a challenge to see if they could do it, Toth said. Plus, Toth’s father and grandfather had their own clock-decorating stories from their college days, so if he were caught, at least his dad would understand, he reasoned. The operation was meticulously planned. This wasn’t some fraternity prank or spur-of-the-moment impulse after a night of partying. Toth, who had some climbing experience and gear, said the operation was dangerous but was carefully planned to be safe. An advance team scouted the Wait Chapel tower. One student drew a scaled drawing of the front of the Chapel so they could figure out how large to make Mickey, while another student made and painted the Mickey Mouse cutout. Another secured keys to give the conspirators access through the locked doors up into the tower. They hid Mickey, ropes and other gear in the tower before the operation. In case they were caught, they held an official looking — but highly implausible — letter on University stationery, supposedly signed by Pete Moore, then-director of the physical plant. The letter granted “employee(s) of Piedmont Hydrodynamics” permission to conduct “thermal inversion layer studies of the air mass … (and) the eddy currents around the steeple,” in preparation for the installation of the new carillon. 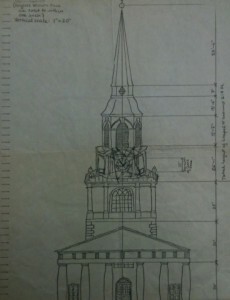 A scale drawing of Wait Chapel was used to determine Mickey’s size. On the night of the operation, one team of conspirators redirected the massive spotlights on Poteat Residence Hall away from Wait Chapel, to provide cover of darkness. As the steeple assault team — Toth, two other male students and one female student — crept up the stairs and ladders higher into the tower, they removed tape placed by the U.S. Secret Service to secure doors before President Jimmy Carter’s speech several weeks earlier. One student removed a section of the louvered vents right above the clock face and lowered Mickey Mouse down into position. Toth climbed through a small trap door, clipped into a rope and made his way around to the front of the clock. The cutout was constructed to fit behind the clock hands, but when that didn’t work, Toth improvised and placed the cutout over the clock hands. The whole operation took about 30 minutes. For Toth, getting out of the tower was easy; getting back in was the hard part. By the time he started climbing back toward the trap door, heavy dew had made the side of the chapel slippery. “The impressions of my fingernails are probably still there,” he says. Excitement over pulling off the prank was somewhat dampened the next morning when University officials moved quickly to remove Mickey, before most students were even awake. The Mouseketeers cried foul, and they criticized the “Mickey Mouse attitudes” of the administration for removing the “detailed masterpiece of intended humor and social comment,” one of the students wrote to the Old Gold & Black. Winston-Salem Journal article on the Mickey Mouse caper. A few students, but not Toth, were questioned about the prank. One campus police officer told the Winston-Salem Journal that criminal charges could be filed against the students. But another officer told the paper he thought the prank was funny. President James Ralph Scales graciously accepted one student’s story that the prank was not done maliciously. “As I understand it, a student has offered to pay for any damage, and if it was just clowning around, then I would think that would suffice,” he told the newspaper. Students collected $80 to repair the clock, even though they insisted that the Mouseketeers hadn’t damaged it; they claimed it was workers removing Mickey who caused the damage. The Mouseketeers had a modest goal for the prank, Toth says. It wasn’t to protest social policy or the N.C. Baptist State Convention’s control of Wake Forest or to make any kind of political statement. It was just meant to bring a little joy to the campus in the weeks leading up to final exams.